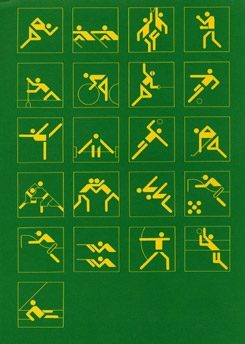 The design of the 1972 Olympic Games resembles in many ways the notion of what we call today corporate design. It was indeed corporate design. The company was the Federal Republic of Germany. The message: Purification. Liberalism. Post-nationalism. 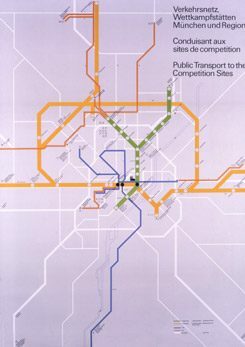 Olympia 1972: Transport Network Map, 1968 - 1972, Design: Otl Aicher | © Florian Aicher, Rotis For good reason: back in 1972, 27 years after the war and 36 years after the Olympic Games has last been held in Germany, the Federal Republic was still struggling to clean up its image. Not only did the country have to, but it also wanted to prove, almost desperately, that it was a modern, pluralistic society. “Modell Deutschland” – the “German model” – was the term coined later by the SPD Social Democratic party for its election campaign. The unflinching desire to portray a modern image to the world, and reach billions of TV spectators through the unique global exposure of ongoing Olympic coverage, gave designers free rein – a possibility they would have perhaps otherwise never had. Olympia Sporting Events Posters “Gymnastics”, “Hurdles” & “Wrestling”, 1968 - 1972, Design: Otl Aicher | © Florian Aicher, Rotis The key person in this endeavor was Otl Aicher, who headed the Hochschule für Gestaltung in Ulm – the Ulm School of Design. It was in this institution that the first German modern design emerged from the ravages of the war. Aicher had previously been responsible for creating mostly corporate design – Lufthansa’s C.I., for example, was his company’s brainchild. Aicher thus set off to tackle the Olympic Games project in the same manner he dealt with corporate clients. 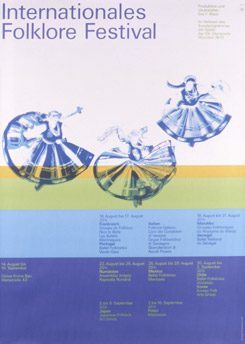 Olympia Poster “International Folk Festival”, 1968 - 1972, Design: Otl Aicher | © Florian Aicher, Rotis The designer’s guiding principle was clear: “You are what you show and you show what you are.” Aicher aimed at a comprehensive approach: everything had to bear the same design – from the uniforms worn by the Olympic staff to the entire range of publicity material, including program flyers, posters and parking permits. Even trash cans and containers had to comply with the design guidelines. In addition, competing “Munich 1972” logos, for example Coca-Cola’s, were supposed to remain concealed. Ultimately, though, Aigner failed in this respect, unable to defy the clout of the strong brands that claimed their first victory in Munich: if we take a closer look, the images of the time often reveal Adidas’ flagship three stripes. 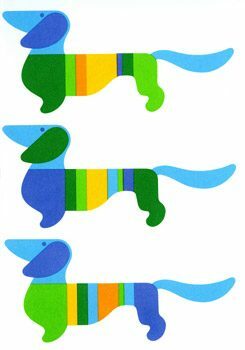 Olympia 1972: “Sporting Events Pictograms”, 1968 - 1972, Design: Otl Aicher | © Florian Aicher, Rotis This rainbow theme took hold and has lived on ever since. Both South Africa’s and America’s “Rainbow Nation” made use of the rainbow as a symbol of diversity. Not long ago, the rainbow flag fluttered anew as a symbol of a new peace movement that added the slogan ‘Pace’ on it. In addition – and above all– the gay movement has come together under the umbrella banner of the rainbow sign. But it was Otl Aicher who invented the political rainbow. His set of pictograms has been groundbreaking to date: even though he himself didn’t create the small stick figures used for public signs – they date as far back as 1936 in Berlin –, nobody had used them in such a comprehensive, ubiquitous way as he did, nor re-designed them with such a sleek, modern appearance. The hostage-taking and massacre that took place in 1972 are always referred to as a German-Jewish story, as the fatal reenactment “of what was once done to Jews on German soil” as Hans-Dietrich Genscher, Minister for the Interior at the time, told the kidnappers. This is tragically true. For Otl Aicher, the man obsessed with controlling every design detail and for whom “image” was a guiding principle, the “image” of Munich 1972 ended up associated, above all, with the total loss of control. Olympia 1972: “Waldi”, 1968 - 1972, Design: Otl Aicher | © Florian Aicher, Rotis The multicolored pop utopia, the 14-day utopia of modernity that Munich 1972 had been until then, became ridden overnight with an evil design of earlier times: the ‘Kübelwagen’ jeeps of the German police, steel helmets, machine guns, military equipment. The outcome: an unfathomable breach, a nightmare – precisely what nobody had wanted. This design utopia that had used artistic means to help create better human beings fell apart during the shootings of September 5 and 6, 1972. Or is it more appropriate to say that it didn’t really collapse because it had never existed in the first place? Had the plan just been to feign it for humankind for a few great days? One thing is clear, though. Never since has such a major and comprehensive design project been attempted for a sports event. 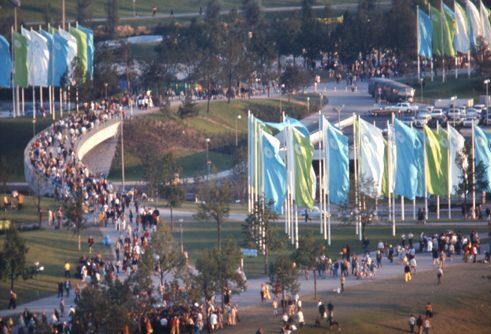 2012 doesn’t only mark the 30th anniversary of the Summer Olympic Games of the modern era. On May 13 of this year, Ulm designer Otl Aicher would have turned 90. The Ulm School of Design HfG Archive, which has held the estate of Aicher’s body of work since 1996, is commemorating these two anniversaries with the exhibition “Otl Aicher – The Rainbow Games. 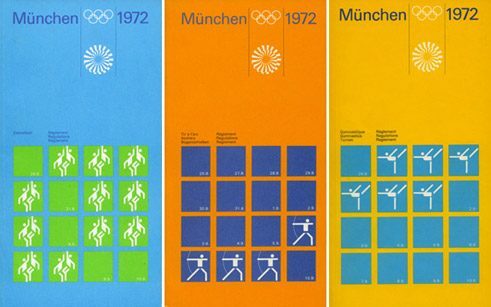 The Design of the 1972 Olympics Games in Munich” from May 13 to October 14, 2012. Jost Kaiser was a blogger for “Vanity Fair” and wrote about political events in Germany and abroad. He also writes for several German newspapers and is editor of the men’s magazine GQ.